Nintendo UK has now confirmed that the Super Mario Maker hardback artbook will not also be sold separately on the official UK store, as stated in its original press release. It will only be available in the bundles outlined below and as a PDF with eShop purchases of the game. We've written on various occasions on how Super Mario Maker will be a vital release for the Wii U, at least in terms of keeping the system ticking over into 2016. Mario games sell, and this creation tool is arguably one of the most exciting releases in the series in quite some time. Of course, one key suggestion has been that Nintendo accompany this release with a hardware bundle - these can be a great way to lure in gamers on the fence. The pleasing news is that this is going to be a reality, and it'll be arriving alongside the game on 11th September; we don't take this for granted, as the Splatoon hardware bundle lagged behind the game in Europe. This bundle is currently confirmed for Europe, but as it's simply a 32GB system packaged with the physical collector's version of the game we'd expect an equivalent North American announcement soon. In addition, it's confirmed that the eShop version of the game will come with a PDF of the artbook, and that book will also be sold separately in the UK by the official store. 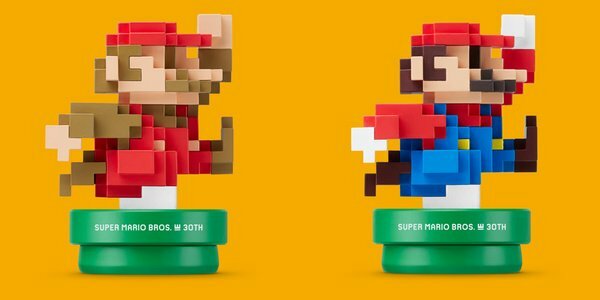 On the amiibo front, that Classic Colours Mario included in the bundles will also be sold separately on 11th September, while the Modern Colours Mario amiibo arrives in Europe on 23rd October. Plenty of options, then. 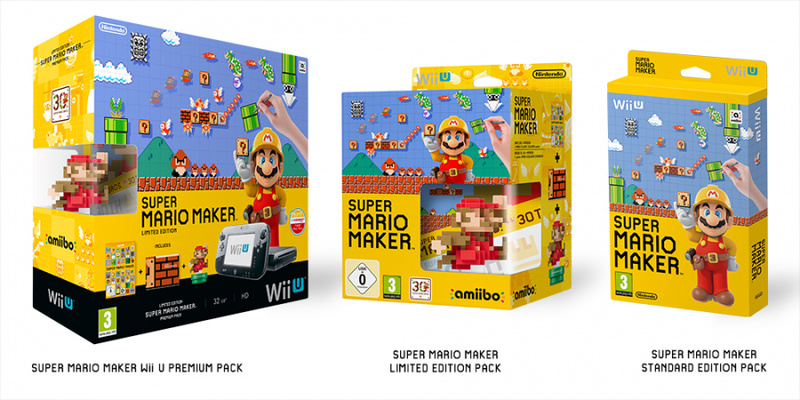 Are you pleased to hear about the hardware bundle, and have you decided how to pick up Super Mario Maker yet? I've got the limited edition pack pre-ordered. Loving the Wii U bunduru pack artwork and content. The price will be crucial as always, but it's going to look very attractive on a store shelf if they can get anybody to actually carry it. i just care about when will they make a 3DS version?? @benptooey did you preorder online somewhere? I preordered with shopto, £47 and whatever delivery is too for the Amiibo bundle. Sadly it works out a lot in Euro so I haven't paid for it just yet in case I find a cheaper price closer to launch. I love the WiiU system box art! Very eye catching, I would think that will sell only ok but will be very much wanted in a few years for mega bucks! Pity I already have my WiiU for nearly 3 years now cause I'd snap it up if I didn't. I'm not too hyped about Super Mario Maker though. I have watched a couple vids on YouTube last night, looks good, but I think I'll be more about playing people's levels instead of making some, but there are some very creative people out there that will make great worlds I'm sure. So I guess we won't be getting another 2d Mario for a few years, which, in my eyes, is a good thing. Kinda overkill at the moment with 2d Mario, and this will keep 2d Mario fans busy for a good while I hope. Also, that blue and red pixel Mario, ugh, do I need it if I'm getting the other boxed version with book and all? I'll try and skip it. Anyway, I hope it sells well for Nintendo! @6ch6ris6 Never? The screens would be way too small for this to be comfortable. @readyletsgo Straight from the UK Nintendo store online, yes. I think seeing videos of the game in competitive environments has me more jazzed for it than if it were just another 2D Mario. I hope they really push that angle in the marketing. I'm still undecided if I want the physical or eShop download version of Super Mario Maker. What's there on the disk anyway? Just the pre set levels, interface and editor. Everything else is levels downloaded and save data, which is on the hard drive or system memory. The console bundle looks great, I must say I'm tempted! Glad they're doing this. This game is literally a system seller for many people. Ordered the limited edition with amiibo from Amazon UK earlier today. The system bundle looks fantastic.If this had been available at the Wii U's launch its fortunes would have turned out quite differently I'm sure. Glad to see an extra for eshop buyers now. I always like extra's with games but they have to include it digitally for digital only buyers like myself. I'm going to pick this game up day 1, btw. Looking great. @OorWullie I think you're being optimistic about that. It would have helped sure but not to the great extent you're talking about especially as most people didn't and still don't know what the Wii U actually is. @123akis Has to be digital for me,this is the kind of game you want on your system to jump in and out of whenever you want.You can pre order the download code from Gamesrocket for £23.75,bargain. that console bundle is tempting but my wallet can't stretch that far so it's just the amiibo bundle for me. I'll be getting the Limited Edition with artbook, amiibo and the T-Shirt from the Official store. They make good lounging around the house gear. Glad they managed a PDF for the extra content for digital purchasers. I prefer PDF art books as well. @FragRed I'm not so sure I am.Nintendo has never managed to sell people on the Gamepad and what its actual purpose was but this game does show what it can do simply and effectively.Yes it would be possible to do on other consoles but without a touchpad and stylus it would be pretty cumbersome. 'Design your own HD Mario levels with a touchpad and stylus to share with the world' is an easier message to get across to the average consumer than 'asynchronous gameplay'. Has multiplayer of any kind been confirmed for Super Mario Maker? Designing levels from scratch is all well and good, but I'd love to be able to share and play them with friends and family. @OorWullie And people would've actually UNDERSTOOD the system, too! Never again, should Nintendo launch a console without their star player. They should know that gamers and casuals alike look for familiarity. Seeing Nintendo Land at E3 2012 was just UGH!! @sillygostly Only in turns as far as I've heard. I'm getting the standard version. I can get it cheap, so I can get the mario amiibo too and still be at least 10-15 euro's better off. I'm really curious to see the pricing of this game and the bundles. $60 for the app/game alone is STEEP. "but as it's simply a 32GB system packaged with the physical collector's version "
It's not simply anything, it's the first time ever Nintendo is bundling an amiibo with the Wii U, so you are getting a complete package. To me that's the big story, well done Nintendo. US won't even get a game amiibo bundle probably. I wish the console or gamepad itself had some kind of special marking on it for Mario's Anniversary to make it really a Limited Edition... but Nintendo probably has a number of Wii U consoles already in surplus. That said, still excited for this game! Ooh I hope they bring this to the US. Who's even going to sell the Super Mario Maker Wii U Premium Pack at this point? There's very few retailers selling the Wii U. I haven't seen the Splatoon Wii U Premium bundle anywhere. The game box looks nice but there's very little effort put into the bundle. How's about new colours, increase the internal memory. The Wii U needs a price drop, it's dragging its knuckles along the ground. @6ch6ris6 Ever since this game was announced, I've been saying that Nintendo should at least make "Super Mario Player" for the 3DS. Sell it as a budget title....or "gulp" a free title, and it would allow you to play fan created Mario levels on the 3DS. @Sligeach Isn't the Splatoon Bundle exclusive to Best Buy? My local store has them. The bundles are great. I'm to the point that I prefer downloading all my games but I will be getting the retail version of this one for the book. As it is, I waited a little over a year into the Wii U's lifespan to pick one up. But had this game and the subsequent bundle been available at launch, I don't think I would have been able to help myself. I'll wait and see the artbook unboxing. Else I'll just go digital like I originally planned. I've got the Classic 8bit Mario preordered anyway and I don't think the amiibo bundle will be sold out immediately on where I live should I go for the physical artbook. I think they're be a lot of 'RIP Iwata' levels created. I got the LE bundle of the game with the art book + amiibo + shirt from Nintendo Store UK, but they sold out fairly quickly (within 24 hours), though the situation wasn't as bad as with the Splatoon triple pack bundles. @dkxcalibur We're talking about Europe. @FragRed I think his point is they would have known what Wii U was if it launched with SMM. Did you see the overly excited host on Fox News? Nobody was that excited when Wii U launched. And all the excitement after the levels shown during the NWC. If that was done at the E3 before Wii U launched Wii U would have sold much better. No amiibo though, they would have to be patched in like MK8, but there weren't any amiibo at the NWC so it's not a deal breaker. But everybody would have known about Wii U and what the Game pad was for, making Mario levels. If that was the bundled game instead of Nintendo Land people might have bought Wii U just for SMM just like most people bought Wii just for bundled Wii Sports. But it's too late now, SMM won't save Wii U. Shouldn't stop a lot of people from having a lot of fun though. You can still jump in whenever you want with a disk, takes like 20 seconds. That digital argument would only really make sense if this were handheld release, where you wouldn't necessarily want to carry all the cartridges with you. @shigulicious I was actually thinking about price after I posted, mainly for the system bundle. Will they tack on $10 for the amiibo? Was also wondering if this will become the new standard Wii U bundle. If they kept it at $299 that's almost a price cut, though it really really really needs to be at $249 by now. @dkxcalibur It wouldn't be free, they are charging 99 cents just for an app to use the 3DS as a Wii U controller for SSBU. Paying extra money to use an extra controller is freaking insane. I aging if we had to pay extra for every Wiimote? I like your idea, but they would charge at least $4.99 for a plsyer. @Captain_Gonru Well the could still have NSMBU, just not NintebdoLand. @rjejr I'd say "first time they bundled a Wii U with all the necessary amiibo for a game that had meaningful support" is more accurate. The UK Online Store has Splatoon Boy and Splatoon Girl Wii U bundles but that means nothing because the game is still incomplete until you have all 3 amiibo. yeah but not North America. If that bundle makes it here it would be the first time amiibo was bundled with a Wii U system in retail stores. I just have the regular edition of Super Mario Maker preordered since I preordered it last year. It's costing me under $50 for it plus tax. Here in Canada it's $74.99 to preorder it. I will just get the amiibo on its own. Good for new users. Personally, I pre-ordered the second of those options a few weeks ago. @Grumblevolcano - "The UK Online Store has Splatoon Boy and Splatoon Girl Wii U bundles"
I don't consider those bundles, more a purchasing thing where you buy them together but they are still in their own separate boxes whereas this is one actual box. And a very cool looking box at that. Great, it's Mario, it has skins from all past 2D games, it has online features... but this one is still a MAKER game, not even close from being a complete Mario adventure. So they're filling the package with an artbook, Amiibo and stuff like that to justify the full price. There are better options for $50-60, or much better bundles if you ask me. @rjejr Well it's Nintendo, so they would probably charge $35 for "Super Mario Player". I think it would sell more games if the player would be free. It won't happen anyways but it's fun to dream! Now, I'll probably get blasted by a special someone telling me that I don't know anything about programming and how much goes into it! @Captain_Gonru - That's OK, I have no use for SMM myself, but it seems to be very popular, and I'm happy to see Nitnedo bundle an amiibo. I really thought SSBU should have had a Wii U bundle w/ fireball Mario amiibo and the Gmaecube adaptor. I'm still not sure why it didn't. So it's not all about my personal preferences, just seeing Nitneod doing something productive for the masses. I already own a Wii U, doesn't matter to me what they bundle or don't. I don't understand why people don't see this selling well. It has a lot going for it that will make this sell well. It has Mario. It's a "maker" game, like Minecraft, Disney Infinity, and Little Big Planet, which are very popular. Maybe I'm wrong but I think this will sell great. @Platypus101 - There can't be another Wii Music, the universe would implode in on itself in order to prevent it. I think SMM will actually be bigger than it should be for a level editor w/o a game. Partly due to Splatoon making the Wii U relevant, partly due to SMM basically having the Wii U to itself. The 3 NFC games will be out and doing well soon thereafter, but they won't stop SMM. looks like the amiibo & game bundle have already sold out in the Nintendo store! I think Nintendo have been really lazy with the release of this bundle, yes the box artwork looks pretty good but I feel a bit let down with this. Five years ago Nintendo released a limited edition red Wii with a built in game Donkey kong and bundled it with New Super Mario Bros, they even released red DS XL with Mario branding on them. What I don’t get is when they released the Wii-U Zelda wind maker pack the game pad has / had nice artwork on the actual game pad. This is just a repacked Wii-U bundle with the limited edition game pack inside, this is a real shame. If the Wii got a built in game then why havn’t they done the same with this edition, this is supposed to be Mario’s 30th Birthday. Yes they releasing standalone 8 bit Mario amiibo’s is nice but not for my wallet, I had been looking forward in Nintendo releasing a limited edition Wii-U bundle as I really wanted to get one but now I have to reconsider this one. I am looking forward to Mario maker and having the chance in playing other peoples designed levels, I even set a countdown timer on my phone for this release. The other thing that I am annoyed about is the SMM Wii-U bundle is not on the Nintendo store’s website yet and I bet when it does it’ll be £300.00. Shame. @MrPuzzlez @OorWullie New Super Mario Bros. U was sold along the Wii U and was the only game that was sellling at the same rate as the console. Have you forgot about it? You're delusional if you think a "make your own mario" would have sold to the masses like crazy. Make no mistake. This game is mostly for fanboys and Nintendo knows it. "Gamers and casuals"..hmm. dunno why but after all these years I still want to punch in the face to people that use that idiotic buzzword. no offense. @KeeperBvK screens too small? is it uncomfortable for you to play 2d super mario plattformers on the 3DS?! why do those sell in the million and get great reviews then? Not getting the bundle. I already have a Wii U. Still getting the game, though. And the amiibo...hopefully. Im getting the limited edition as well as the modern colour Amiibo. @minotaurgamer There are people who didn't care for New Super Mario series and 3D World and this will tempt them - remember not all Nintendo fankids past & present own a Wii U. The equivalent to the Wii Mini for the Wii U? Much too little, for way to late. At least the Wife can use this for Nextflix though. Are they still calling it a "premium pack" though? 32GB... lol I agree with you that this should of a been a launch pack-in game for the Wii U.
I want the amiibo bundle. Have been enjoying NES Remix games with friends lately. This will blow them away. I'll be buying the amiibo bundle (if it does in fact come to NA). Great news overall. Hopefully it comes to NA. Huh. Just noticed how they cleverly (almost) adapted the old classic color Mario into a "construction" mario. So "construction" mario looks like the classic colors with a hardhat. The yellow is just mustard enough to be an almost match. That is one handsome bundle. I'm sure NA will offer a bundle too that is lower in quality like it always seenu to be. I'm getting the bundle with the game, amiibo and art book. I'm very uncreative and so probably won't design that many levels, but I'm really excited to try out everyone else's designs. @Ichiban The packaging alone with that clear window is pretty slick. @6ch6ris6 I'm tired of these 3DS fanboys who are demanding more exclusives. As if you don't have enough already, Nintendo is releasing even more in the near future. 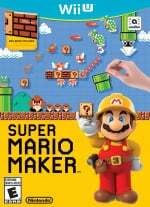 Want Super Mario Maker? Buy a Wii U. Don't get me wrong, the 3DS is a great handheld. @ningeek185 so i am a fanboy for wanting a game? okay. whatever. @6ch6ris6 Maybe we can both conclude that I'm enraged about Nintendo's decision to launch several 3DS exclusives this year/next year. Nintendo's almost shaming the Wii U.
Holy crap that box is awesome! If it didn't cost money and also if it made sense to own 2 WiiUs I'd TOTALLY buy one to put on the shelf next to my Xenoblade X WiiU box. @ningeek185 i understand you. but the wiiU is dead. nintendo already knew that months ago. i am pretty disappointed by the upcoming 3DS lineup though. the 3DS also has reached it's peak months ago. @6ch6ris6 Coudn't agree more, the upcoming lineup of 3DS games are trash. Mario and Luigi: Paper Jam? Seriously? Two Mario's at once equal nonsense. And let's not get into Federation Force.